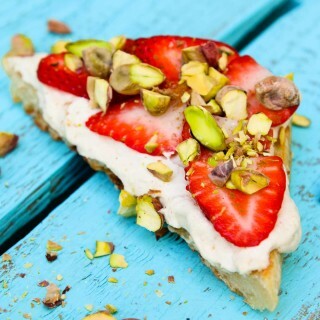 Indulge in this flavorful toast topped with vegan mascarpone, pistachios, and fresh strawberries! Drain the soaked cashews and macadamia nuts. Add them into a powerful blender (I used my Vitamix). Add the apple cider vinegar, fresh lemon juice, and water. Blend on medium and then high, using your tamper to push everything down until you get a nice smooth cream-type consistency and there are no pieces of nuts remaining in the mixture. You should be left with a smooth thick creamy mixture. Add the pure maple syrup, cinnamon, and salt. Blend once more, pushing everything down until completely blended in. Remove the mixture from the blender into a mixing bowl and set aside. If you have not yet prepared the unsweetened coconut whip cream, do it now (see notes below on how to make your own). Fold in 1/2 cup of prepared unsweetened coconut whip cream into the mixture in the mixing bowl until fully combined. The final Cinnamon-Infused Vegan Mascarpone should be thick and creamy, yet have a light component to it from the addition of coconut whip cream. Feel free to adjust the amount of maple syrup and/or fresh lemon juice if needed, but keep in mind that the taste of this vegan cheese should be more on the subtle side and not very bold (slightly sweet, slightly tangy, with a hint of cinnamon). Depending on the shape and thickness of your focaccia bread, cut it into triangles or squares, and slice it in half horizontally. Toast each slice of focaccia bread and allow it to cool on a wire rack. Once cool, spread a generous layer of the Cinnamon-Infused Vegan Mascarpone Cheese. Topped it with a generous layer of sliced strawberries. Sprinkle on some chopped roasted pistachios. (optional) If your roasted pistachios are NOT salted, sprinkle on a little sea salt. Repeat with the remaining pieces of focaccia Store any extra vegan mascarpone cheese and coconut whip cream in the fridge. This recipe tastes best with some sort of Focaccia-type bread. You can easily make your own at home, but to make things easier, I bought mine at a local bakery that makes them fresh daily. Be sure to use the most basic type of Focaccia bread such as sea salt or plain olive oil. If you do not have Focaccia, you can also use any other plain or gluten-free bread. To Make Unsweetened Coconut Whip Cream: Place 1 can of coconut cream (the one from Trader Joe's is the best for this) OR 1 can full-fat coconut milk (I prefer Thai Kitchen brand) in the fridge for at least 24 hours. Once ready, slowly turn the can upside down, open it, and discard any liquid (the part that did not solidify, if there is any) and scoop out the hardened solidified coconut cream into another small mixing bowl. Using a stand mixer or electric hand mixer, beat until fluffy. Start on low speed and work to higher speed until you start to see stiff peaks forming into Coconut Whip Cream. Note you will only be using 1/2 cup of prepared coconut whip cream in this recipe. If you have leftover Coconut Whip Cream, you can beat in a tiny amount of pure maple syrup or powdered sugar to sweeten and store in the fridge for use later on in the week! Serve it over fresh fruit, use it on ice cream, or just eat a spoonful of it like I do!